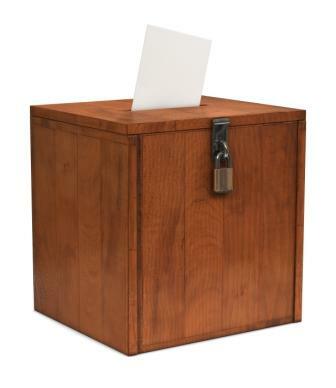 I advocate the adoption of the Dual Electoral System with the number of seats set at 150. This giving a House of Commons of 300 members. After each election the percentage of eligible voters out of the national total is determined for each province and territory. This is used to determine the number of seats to be allotted to 2 decimal places. The decimal remainder is dropped giving you less the 150 seats. Any province or territory that has 0 seats is given 1 seat. All provinces and territories are guaranteed at least 1 seat. If the number of seats is still less then 150 then additional seats are allotted to a province or territory in order of the highest remainder first till 150 is reached. **Additional to bring seat total to 150. Instead of a full revision of the electoral map every 10 years you have a partial revision after each election. The smallest riding in a province or territory must be at least 50% of the number of voters of the largest riding in that jurisdiction. Because you can have the ridings with a greater spread in number of voters you don’t have to have ridings within a narrow range. A province or territory that gains or loses seats will have some boundaries redrawn. A jurisdiction that doesn’t change in the number of seats might have some ridings redrawn to keep ridings within the range of 50% of the largest in that province or territory. Finished converting the results riding by riding from the election. 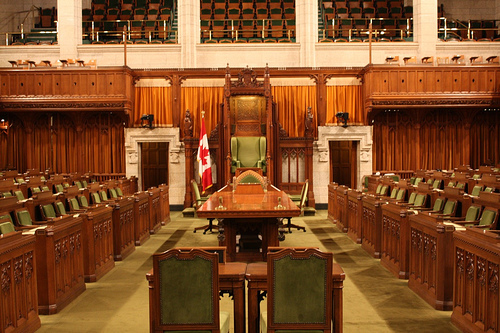 I advocate a 300 member House of Commons elected from 150 ridings. If that was the case the election would have result in roughly 134 Liberals, 99 Conservative, 57 NDP, 9 Bloc, and 1 Green Members of Parliament. 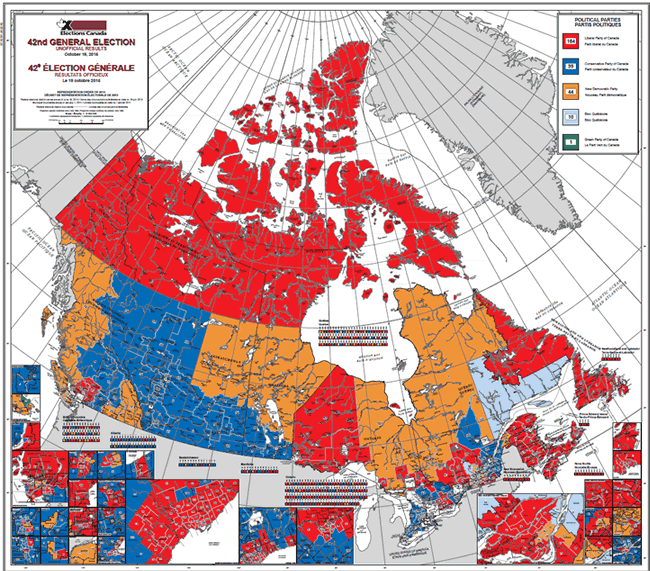 Election day for the 42nd federal general election. Time for all those eligible to vote and who haven’t already done so to vote. I voted by advanced poll on Friday October 9. At the start of each Parliament the Speaker after the members of the House of Commons are sworn in asks “who should the Governor-General call upon to form a government”? The four most endorsed candidates are invited to Rideau Hall and asked to form a council-designate, a government-in-waiting. After each leader who accepts forms a proposed government of say 16 to 20 members the Speaker puts the question to the House “which of these councils-designate has the confidence of this House”? The two with the least are dropped from the second ballot. The Commons votes a second time with the winner becoming the Council of Ministers and the loser the Council of Opposition. No vote in the House triggers an election only an absolute 2/3 majority (226 out of 338) passing a motion of dissolution can trigger an election before the set election day. No vote can replace the current government with another. The Council of Ministers is the government for the duration of that Parliament. Any individual minister can be dismissed by a 60% vote of the House. If it’s the Prime Minister then an absolute 60% majority (203). Seven more days till the 42nd Federal general election. All citizens should vote and view doing so as an obligation to their fellow citizens. I missed the first federal election I was eligible to vote in and I can’t recall why I didn’t. The same for Quebec but I wasn’t in the province at the time. But I’m 8 for 8 of the last general elections for both the Federal and Quebec. Voted for the first time by advanced poll. It opened up at noon on Friday October 12 and I was down there at 1:30. A line up which I didn’t expect. Maybe around 20-40 people ahead of me. I didn’t get out till 2:30 so an hour to vote. The only difference from regular being required to sign a register. I was surprised to see the Rhino party on the ballot. To all my fellow Canadians VOTE !